From problem to solution. From “holes” to a treatment that starts from the research and comes to the fielding of innovative and performing solutions developed by Italian company Polycykle. A combination of two of its products played a decisive role in a test conducted in Rome, along Via della Pisana, where a bituminous conglomerate totally cold produced with the reuse of 100% milled asphalt. The Conselab Srl laboratory in Rome collaborated during the test. Products involved are: Polygen NANO, a regenerant with several properties (it low the processing temperatures, bitumen regeneration, activating agent), and of Polyflux NANO, an additive that promotes cold workability. The two additives were added to the milled asphalt and mixed for about 30 seconds until they were homogeneously dispersed. 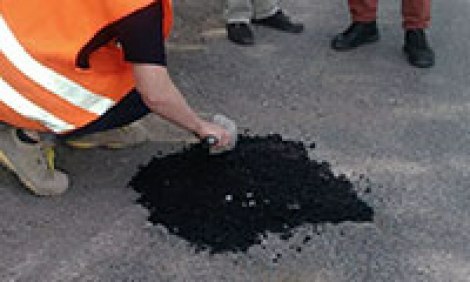 The Polygen NANO dosage was 0.2% on the weight of the mix, while Polyflux NANO was added in the measure of 25% on that of the bitumen present in the milled asphalt. A cold CB sampling was carried out using reclaimed asphalt material containing about 5% of bitumen. The product was used the same day to close a hole, demonstrating an ideal dispersion and easy compaction. The road surface was immediately made passable. After about 20 days (three of which were very rainy), a check on the tightness of the laid material was carried out. The result: the hole is perfectly closed, without troughs, and the restoration carried out gave full continuity to the road surface.